This quilt was a fun one to make, and a fun one to see finished! It seems like it was a long time coming — perhaps because I collected these great Munki Munki prints for so many years. I love Heather Ross (as you know! ), so of course I felt I had to collect these early prints she designed for Munki Munki. Recently I had the urge to let them see the light of day, and decided to cut them all up and use them all together in one quilt. 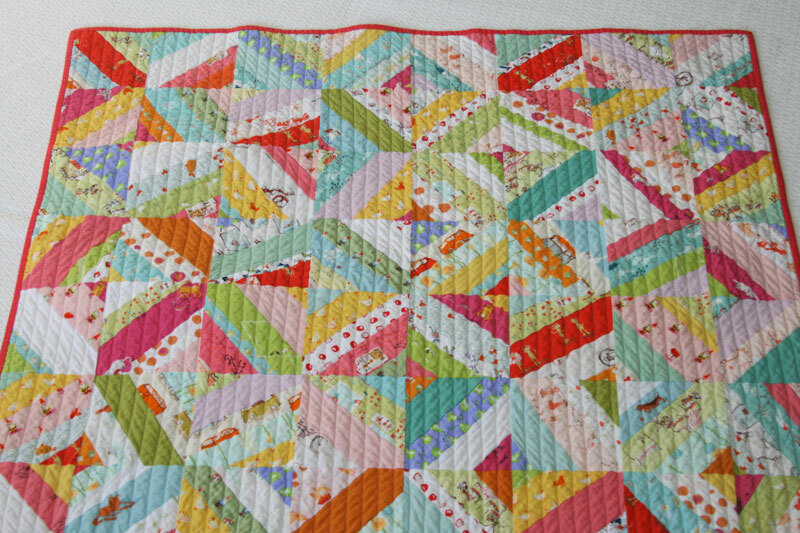 It’s playful and fun, cheery and bright, and makes a really great I Spy quilt. It’s also quite possibly one of the softest quilts – these prints are printed on the nicest base cloth and it washes up to become buttery soft. 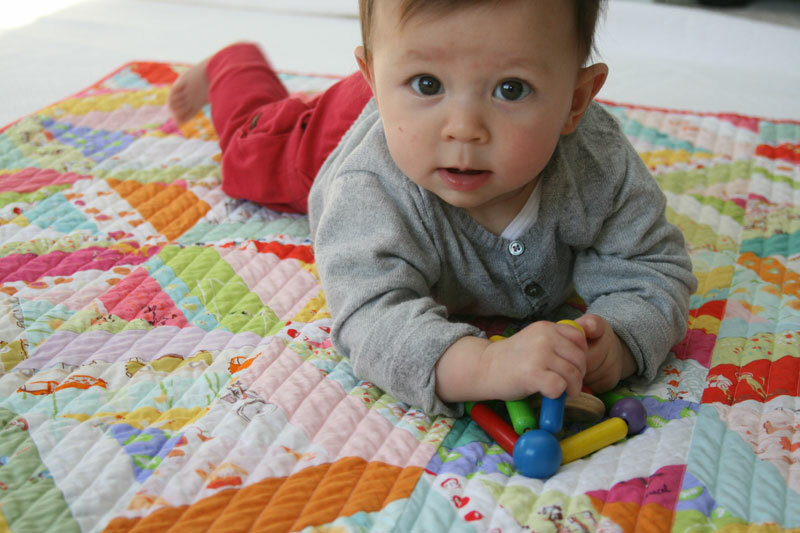 Perfect for a baby quilt, no? I quilted it with straight lines (a bit tedious to quilt, but well worth the effort!). The batting is my favorite Quilter’s Dream cotton, and for the backing I opted for the wonderful strawberry print from Heather’s most recent line, Briar Rose. And as much as I love it, it’s listed here in the shop. The fun for me was collecting all these prints and then sewing them into a quilt. I’m hoping someone out there will have fun snuggling under it! A previous post about this quilt can be found here. 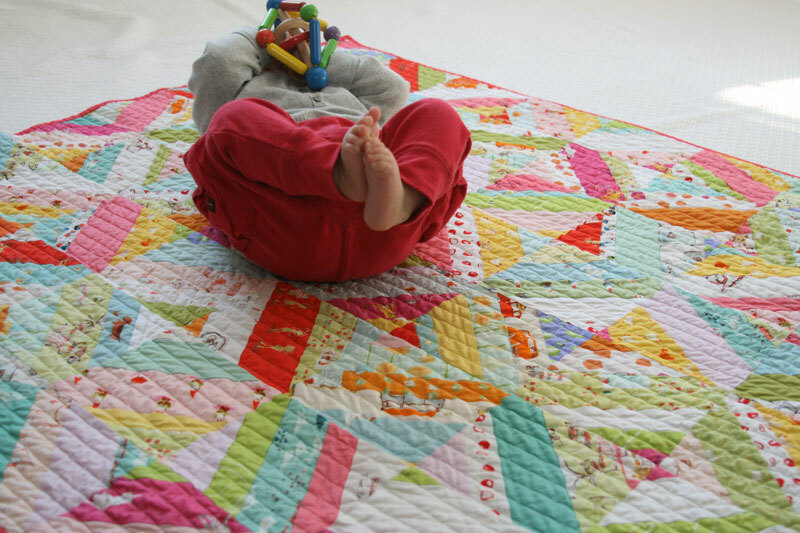 This entry was posted in [search] String Quilts, baby, Fabric, Posts about Quilts, Quilts and tagged baby quilt, briar rose, handmade, Heather Ross, i spy, munki munki, string quilt. Bookmark the permalink. Adorable! I love that strawberry backing, the scrappy string top, and of course that baby! “mazal tov”!!! means good luck in hebrew. i cannot believe you made so many quilts last months. Pretty !! And wow, that is a lot of straight lines!! But it really is beautiful! This is such a sweet quilt, I love it! Another great example of simple is beautiful. 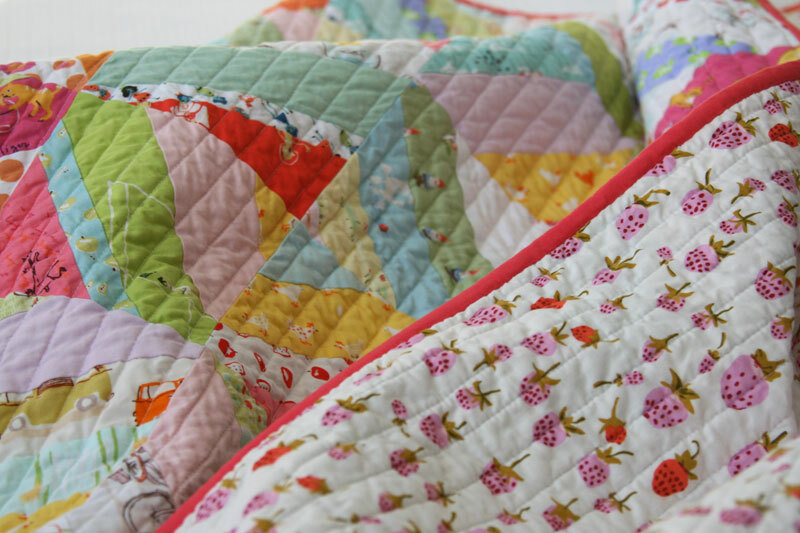 I love the quilting too – perfect choice. what a lovely quilt again ! Those little prints, the Color combination and the back with strawberries….just gorgeous ! Wishing you an enjoyable Holiday ! That baby is definitely related to her brother, and they are both as cute as they can be. So great for pictures. Pretty quilt too. 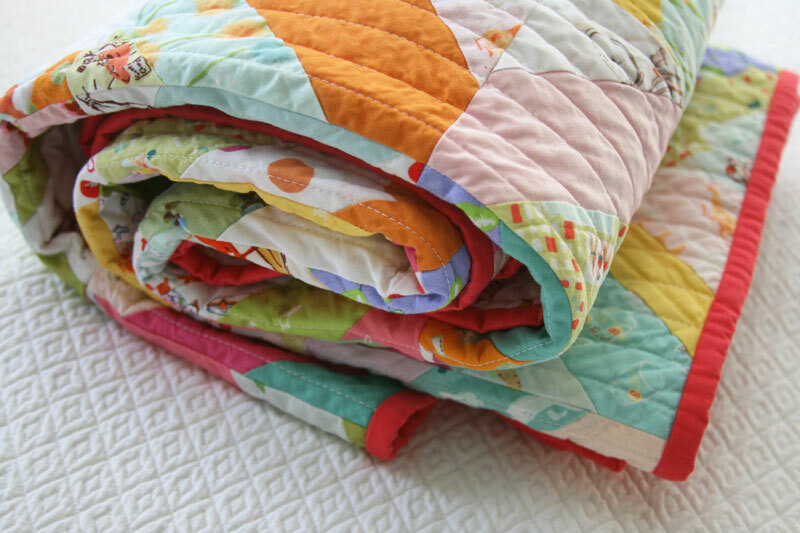 This quilt is just way to sweet. Love the fabrics and the straight line quilting. And the baby is adorable! This quilt is gorgeous! 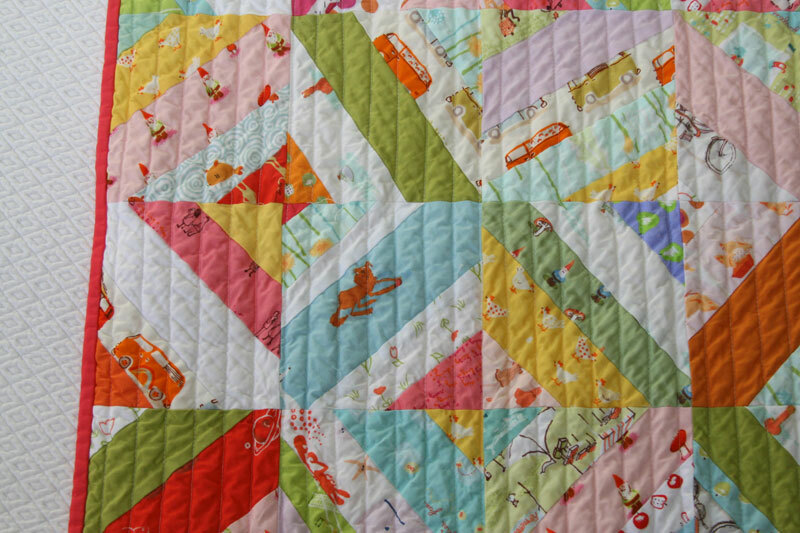 Just love the straight line quilting.